2 cups chopped vegetables: choose any combination of carrots, sweet potatoe, capsicum, broccoli, parsnips, spinach, kale etc. Choose whatever is in season. 1. Rinse dal and rice/quinoa together two or three times in cold water. 2. Heat ghee in a large pot together with the mustard seeds on medium heat until seeds begin to pop. 3. Add remaining spices and cook for 2 minutes. Be careful not to burn the spices.The aim of the game here is to heat the spices enough to allow their flavours to burst open and infuse the ghee. 4. Add the chopped veggies and stir fry for 5 minutes to coat them in the gorgeous spices. 6. Add the rice and mung dhal. 7. Bring to the boil and cook on high heat for 10 minues. 8. 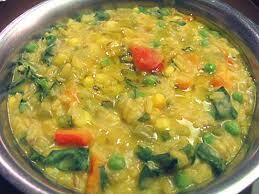 Cover and simmer until both dhal and rice/quinoa are soft. This take approx half hour. 9. Adding more water as necessary. Kichari in a Hurry !!! Put all ingredients in a pressure cooker, bring up to pressure and cook for 10 minutes, remove from heat and let sit for another 10 minutes. Throw on the fresh coriander and add yoghurt as above. This is such a great way to prepare kichari especially when you are short on time and have no heating facilities at work. You get a freshly cooked satisfying lunch which will be the envy of all your work colleagues !! 1. Use methods 1-7 as above. 2. Transfer ingredients into a food thermos flask. 4. Open the flask at lunch time and voila..a fabulous warm freshly cooked meal. PS: cooking times will vary so you may need a few goes at this before you get the preparation cooking time right. Replace veggies with yoghurt and banana OR almond/rice/un-homogensied milk, cinnamon, raisins, agave syrup and nutmeg for a delicious breakfast or yummo sweet treat. * Eat kichari for all 3 meals a day for 4 - 7 days for a great detox and cleanse for the body and mind. *BE SURE to rest the body and mind with any detox as the body needs to be supported through the process. If you are rushing around doing your daily routine and work then the body gets the signals of stress and will not allow the toxins to be flushed out, but will instead hold onto them. * This eating plan also helps with weight loss/management.